I cried. I legitimately had to put down the stupid book and cry for about an hour. I’ve had this massive migraine all day, and I’m pretty sure it’s because my brain and heart have just collapsed after this emotional rollercoaster of a novel. And now I swear I’m about to cry again because I can’t even think about the stupid novel without everything inside me just falling to pieces. But it’s okay. I’ll hold it together to type up this review (maybe it's better classified as a catalogue of my feelings). There are no words to describe the sheer extent to which I love this stupid, stupid novel. It's the perfect YA love story, but at the same time its imperfections make it entirely too real. If that makes any sense. John Green's writing is beautiful in its own right - there's an admirable simplicity to it, interspersed with heart-wrenching passages that left me reeling. But then, there's the ending. 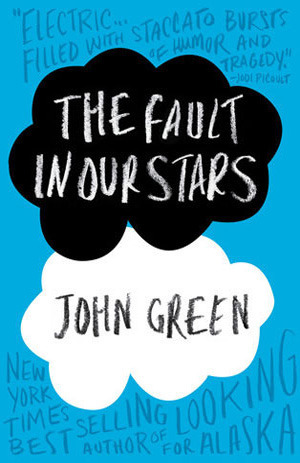 I don't think I've ever cried so much over any other book – or movie – in my entire life. It was just… no. It was so sad. And so happy. Scratch that - it was simply cruel. This is what true love must be like. This is what they were talking about in The Notebook. I totally get it now. 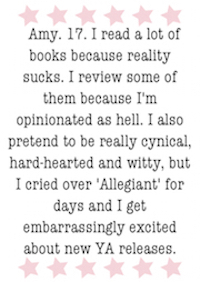 You are a cruel, cruel creature, John Green. I hope you get lots of horrible angry fan mail from the people whose hearts you’ve just crushed. But at the same time, you are somewhat a literary genius. And I love you for writing this incredible book. Hazel and Augustus are going to hack their way into the hearts of teenagers everywhere, and then light a massive fire that will slowly burn them out from the inside. And John Green will sit there laughing and laughing at the havoc he's caused. Regardless, you should all go read the novel immediately.